Do you think you can find your way through the maze below. This is one of the main thoroughfares through the city of Hyderabad. This is typically what happens - it rains - the traffic signals go off - the cops stay out of the rain - since the signals are off everyone takes off from the stop line as if its the start of a race to the other side of the road - the first few lucky ones get through - the others end up somewhere in the maze shown and all the other unlucky ones get stuck somewhere way behind. Now you might wonder what happens if you dont start and wait for the traffic signals to start again or a cop to come and direct the traffic. There are few of the many things that may happen - you may have to make an appointment with the ENT specialist to get your ears checked up due to the cacophony of horns behind you or you might just get run over or worse the traffic would just reach you and surround you from all sides like an octopus wanting to give you that all encompassing hug. Why do we kill ourselves this way - its something that I have no answer for. Is it the uneducated that cause this - absolutely not - its the most educated guy who shows his power of causing the jam. jump a traffic light (so what), drive on the wrong side of the road (so what), drive looking the other way (so what). With the ever increasing traffic volume it does not get any better. The roads are the same size, the roads can only take so much in terms of number of vehicles, the public transport is the saddest and the traffic sense is abysmal. - We need to get better traffic sense. Almost an impossible thing to do but then if its for our own good we better try and perform miracles. - Have better and well demarcated footpaths and foot bridges so that we get people off the roads. - Invest heavily in a good public transport system. - Get all the government working from outside the city so that they can come and go as they see fit without inconveniencing anyone due to stoppages in traffic. - Build public parking facilities in all the commercial areas. 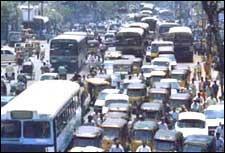 I do not see anything changing by widening the roads and building flyovers that are just going to get choked as quickly as they were built. We tried that out a few years ago and it has just not worked. This is what happens when the road is widened. Since the road widening eats up into the set back of the building which used to be used for people getting out of their vehicles in the building and for parking in other buildings now that this place is gone the people do the same thing that they used to do in the buildings on the road now. The footpaths are all gone so the people start to walk on the road. Hence by widening the road no one has achieved anything other than the contractor making a handsome profit and the local bureaucrat lining his pocket. Are we going to do something about this - well I think it is upto each one of us to try and do something before I write my next article stuck in traffic !!! 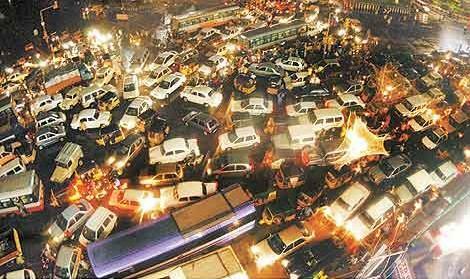 With 2 & 4 wheelers becoming more affordable to people, we can only expect the traffic to get worse. Unless we improve ourself. Since we cant limit the number of vehicles to improve the traffic, we should find alternate ways to achieve the same. Like ensuring that the vehicles do not remain on the road for long time. In other words ensuring the destination is reached sooner by improving the road conditions. Following are some which reduces the speed. 1) The driving experience is made miserable by the Autos(3 wheeler) driving at slow speed. All auto drivers go at a snail's pace when they are looking for passengers. They would be keeping about 2 feet on their left side, Auto itself taking about 4 feet. So on most of the 2 way roads, they would be forcing the traffic behind to that pace and no amount of honking would speed them up. This motivates the drivers behind to drive on the other side, causing inconvience & leading to traffic jams. Solution: We should implement minimum speed limits on all roads and must enforce drivers to adhere to these. Solution: We should have Auto stand wherein Autos wait for customers or to regulate their movements on road. 2) In most of the roads the footpath is encroached by hawkers or for parking or to urinate. This forces pedestriants to walk on road. 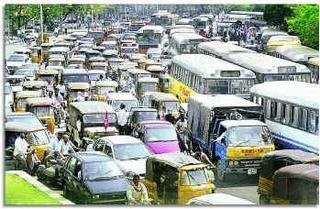 Since the pedestriants movement cant be predicted, the drivers oblige by reducing speed. Solution: Ensure all road encroachment are removed at all times. Punish repeat violators heavily. Citizens could help by not entertaining these business. Restore footpath for pedestriants for walking only by keeping it clean and well lit. 3) Potholes or uneven roads. Solution: Take photo and publish it in newspaper! !